At an overcast and climatically unpredictable Portimão circuit in the Portuguese Algarve, the top 15 World Superbike riders from the two qualifying practice sessions made their way out on track for the first of the three Superpole sessions. After the first round of flying laps it was Laverty who lead the way, followed by the likes of Rea, Camier Baz and his team mate, Guintoli. Laverty was the only rider to dive straight into the 1m 42s lap bracket. His lead was shortlived however, as Mr Superpole, Tom Sykes stamped his mark on the SP1 session with a time of 1m 42.674s, nearly two and a half tenths ahead of the factory Aprilia duo of Guintoli and Laverty. Out of nowhere with two minutes to go, Carlos Checa topped the time sheets since what feels like forever, bettering Sykes’ lap time by 4 hundredths of a second. This is one of, if not the first time that Checa has lead any session on the all new Ducati 1199 Panigale R since Phillip Island. Although this too was short lived as firstly, BMW’s Chaz Davies toppled the Spaniard off his metaphorical plinth by 8 hundredths of a second, quickly followed by Frenchman Jules Cluzel, who went a further tenth quicker – the fastest lap time set all weekend. Come the chequered flag to end SP1, it was Neukirchner, Haslam and Camier who did not make the cut into Superpole 2. Badovini on the other Ducati Panigale, along with former provisional pole sitter Jonathan Rea, slipped through to SP2 by the skin of their teeth in 12th and 11th respectively. The SP2 session got off to a slow start and a very abrupt end as the red flag came out after a matter of minutes, due to rain beginning to fall on the officially dry session. Due to the delay and the tight schedule, the SP2 and SP3 sessions were merged together to form a combined twenty minute wet session, for the top twelve riders to scrap it out for pole position. Despite the session being declared wet, it had largely dried before most riders had even left their pit boxes. Although perhaps there was one or two wet patches given that Davide Giugliano low sided and dumped his Althea Aprilia into the gravel on one of his first laps. The flying laps began rolling in soon after, a blistering lap time from a determined Jonathan Rea on the Pata Honda put him top of the pile for the third time this weekend. With the track being completely dry again, the times had fallen down into the 1m 41s bracket, an exclusive club for which during the first ten minutes of the session, only Rea and Laverty had membership to. With eight minutes to go, riders had been in their pit boxes to make final set up changes and were back out on track ready to put in their final flying laps in a bid to grab that all important watch… and front spot on the grid, of course. With six minutes left on the clock, Tom Sykes put his first bid in for the watch and entered the 1m 41s club, going nearly half a second quicker than anyone else has all weekend with a time of 1m 41.360, smashing his outright lap record of the circuit, which he set last year. That put the Huddersfield man ahead of Rea, Laverty, Melandri, Guintoli, Baz, Checa and Fabrizio rounding out the top eight positions. Two minutes later and Irishman Eugene Laverty went second with a time just one thousandth of a second behind Sykes’. This time also broke Sykes’ previous lap record of the circuit. No other rider had any response to Sykes by the time the chequered flag came out, with the top five positions ending up the same as they were six minutes prior to the flag appearing. 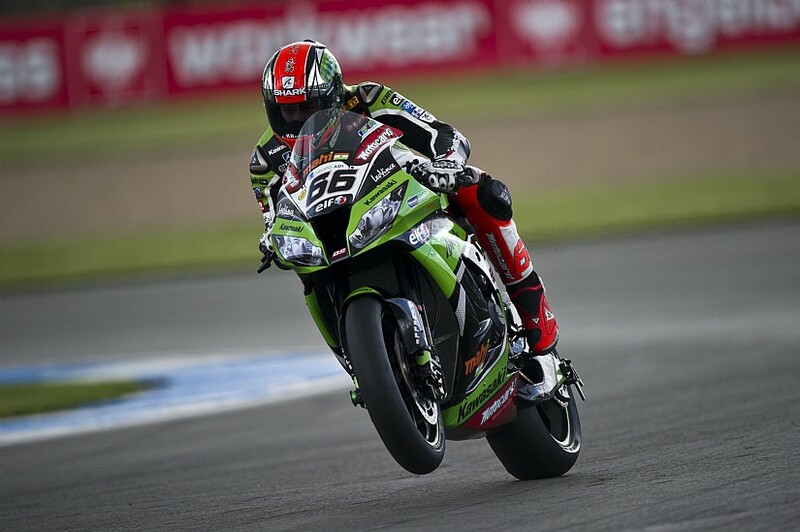 This means that Sykes will start tomorrow from pole (with another shiny new watch), alongside Laverty and Rea. Melandri will head the second row, alongside Guintoli and Sykes’ team mate, Frenchman Loris Baz. The other British rider featured in SP2/3 was Chaz Davies who was evidently struggling out on track and only managed 12th spot on the grid.